Soon After several bags of Werthers Original Chewy Caramels landed in my mailbox courtesy of BuzzAgent. It’s fate I tell you! Fate! I made a few substitutions to The Cooking Photographers’ original recipe. I didn’t have nor did I want to buy powdered apple cider mix. Instead I whirred 1 tablespoon of all spice and cloves, 2 cinnamon sticks and ¼ cup of brown sugar in the blender and added them to the batter. I used both the traditional Werther’s Original Chewy Caramels and the Carmel Chocolates in the center of the cookies because I’m a wild woman. I used whole wheat flour instead of white to see what it would do. 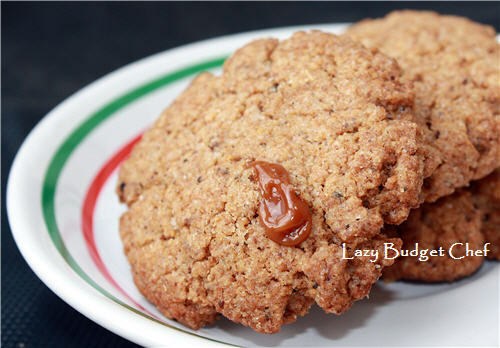 I like the extra nutty taste the wheat flour give the cookies. Paired with the caramel it tastes like fall. They smell like heaven when baking. Disclaimer: I received samples of Werther’s Original Carmel Chocolates, Chewy Caramels, and Cream Carmel Filled candy via Buzz Agent. All opinions are my own. I am not required to blog about them but choose to because they made my cookies sing! Carmel?! OMG these sound delicious. I'm going to try them and I'm also going to try your substitutions. I love the flavor of whole wheat in baked goods although I know sometimes it is a little too dense for some recipes. But this one sounds awesome! Those sound delicious! I am always looking for things to bake with my kids and they love caramel so these sound perfect! I featured your cookies today. Those look delicious! Thanks so much for linking up with us at Show & Share! Can't wait to see you again on Wednesday!